During the years after the trial the works and the wooden barracks south of the road were dismantled. The stone barracks were kept as living accommodation. Gradually the buildings were bought up by private people and changed into houses. The open mine filled with water and has become a valuable biotope on the edge of an army training area. The concentration camp was forgotten. 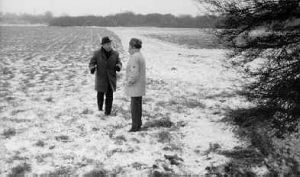 In 1965 Victor Malbecq who was a prisoner of the Schandelah concentration camp as a nineteen year old , returned to his place of suffering. He asked the way to the former concentration camp in Schandelah. The people looked at him in astonishment. They did not know anything about a concentration camp. Finally he got the information that there used to be a camp for foreigners outside the village. It took until 1982 when files about the concentration camp were found and read in the London Public Record Office and copies of the truth were brought back to Schandelah. The local parties CDU and SPD were asked for help and participation in dealing with this local history. The CDU offered their help as far as they were able to and the SPD, despite being reminded did not reply at all. 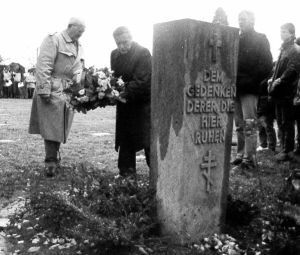 In November 1982 the first memorial celebration was held near the prisoner's camp on private grounds. 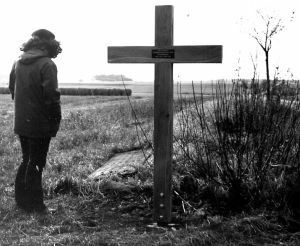 A wooden cross was erected at the edge of the road. About 200 people took part. Official local representatives did not come. The words on the wreath quoted Ilse Aichinger: He who forgets the dead commits murder a second time. A central aspect of the memorial service was the question of where the dead men were buried. The graves had not been found then. Before it was possible to answer this question the remembering came under the wheels of the burocratic Lower Saxon road construction authorities on whose stretch of land the cross had been erected. There was also opposition from some of the people who lived at Wohld who did not want to have their homes described as a former concentration camp. Two days after the memorial service the road constructions authorities wrote to inform that a 180 cm high wooden cross had been illegaly erected. As no building permission had been applied for, the department manager demanded the removal of the cross within one week. No mention was made of the concentration camp, its victims, the memorial service or any sign of understanding. In a disciplinary complaint against the manager the Lower Saxony authorities noted that it is not necessary to obtain building permission for such a memorial. However, the road law had been violated. The cross was taken down and stored in order to prevent the victim's memory from being damaged by the burocratic bog of German public authorities. One of the people who lived in the settlement, the one who activated the resistance to the memorial, wrote in a letter that a new Holocaust had been produced because of the memorial ceremony. Now there were tearful children in the settlement who were called jewish pigs by children at school. She wrote a petition to the Lower Saxon parliament demanding that a memorial be not permitted and that it should only be put up at a neutral place, for instance in the Church or at the Schandelah cemetry. Several people said that before organising the memorial service a talk with the people who live in the settlement should have taken place. It was a mistake not to have done this. Local politicians refused to participate because they did not want to support party politics of the green party. They did not notice that their ommission was party politics itself. 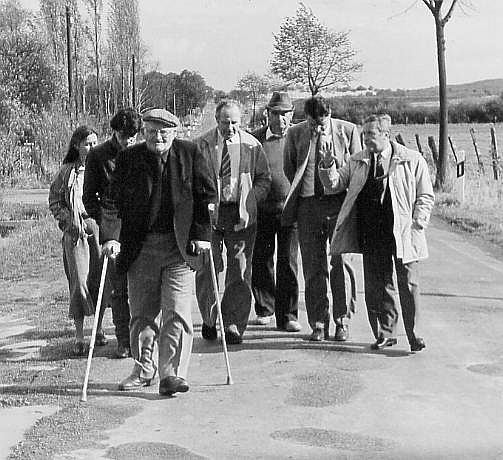 Two former prisoners, Eugene Marion from France and Victor Malbecq from Belgium, visited Schandelah in October 1983. They came back to take part in the first memorial service in the Scheppau graveyard. Eugene Marion quoted the words on the deportation monument from Paris on the Ile de la Cité: Forgive but don't forget. This is the attitude of the former prisoners after their liberation. And: How could we forget such a tragic epoch of our life? How could we chase our dreadful memories away? 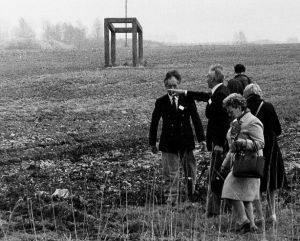 Two years later the Cremlingen local authority set up a memorial stone at the edge of the former oil shale mine in the Wohld settlement. Since then each year in May memorial services organised by the municipality are held at which former prisoners and their relations participate. On 1. May 1995 the town of Königslutter put up a memorial stone with an explanatory text at the Scheppau cemetry. The cross from the first memorial service in 1982 was also permanently erected. Members of the Scheppau local SPD look after the graves and provide floral decoration for the annual memorial service. 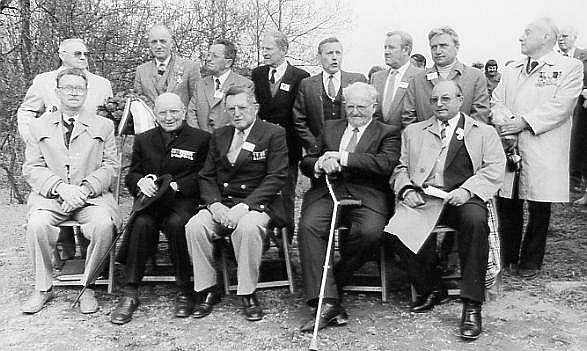 Gustave Delaunoit, Emile Kindt, Maurice Burosse, Henri Higelin, Victor Malbecq, Paul Jenn, Raymond Venara, Jean Jorissen. Henri Ingelrest, Henri Bonnichon, Georges Siriex, Eugène Marion, René Olejniczak.